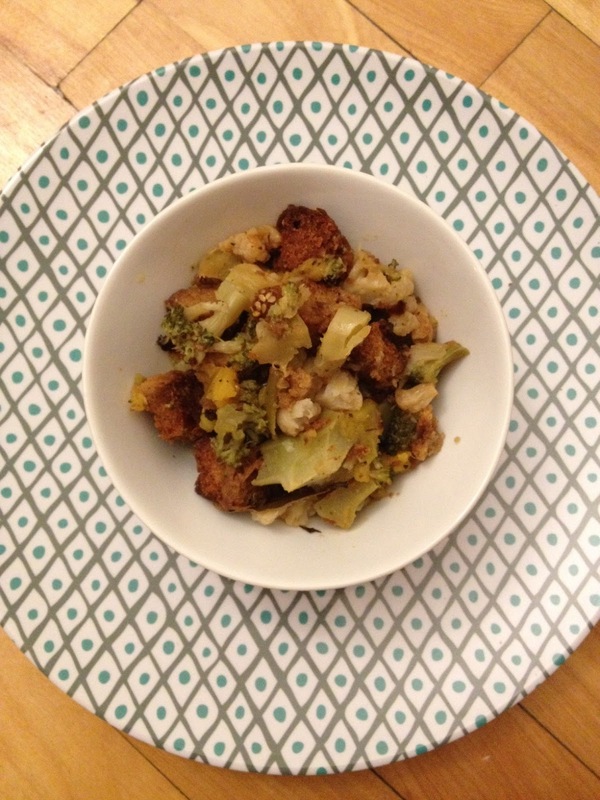 Itsy Bitsy Balebusta: November Kosher Connection: Stuffing! As Robin from How I Met Your Mother so eloquently put it, "Thanksgiving in November. Weird." As a Canadian, I say... Thanksgiving is a holiday celebrated in October, in the midst of the Chaggim. As a food blogger, all I can say is, "YAY for American Thanksgiving!" Another chance, a month later, all on its own, for baking sweet potato pies, turkey and stuffing all in the name of recipe development! I couldn't have been happier with the selected theme for this month's Kosher Connection. When it comes to Chaggim I don't have classic family recipes. I don't have any special honey cake recipes for Rosh Hashana or classic latke recipes for Chanukah. That isn't to say that I haven't been able to incorporate my Mom and grandmother's fantastic recipes into these meals! Being the first to celebrate all of the Chaggim, I've worked to fit my families classic recipes into my new traditions! Thanksgiving is different. It's quite possibly, one of my favorite days of the year. It's the holiday where my family is able to come around the table together, and share in a "holiday" as one. Truthfully, I'm very lucky in the sense that minus the turkey and trimmings, any Sunday dinner has the same festive atmosphere! So when it came to coming up with a recipe for stuffing, I thought it was best to stay within the traditional context, and started pulling all of the herbs I could find out of the spice rack. Given that it's the one traditional meal we celebrate together, I thought this was only appropriate! Stuffing and cranberry sauce are my favorite parts of the Thanksgiving meal. It's rare that I have them the rest of the year (although for years, I ALWAYS had to have cranberry sauce with chicken, to "fool" me into thinking it was turkey or else I wouldn't eat it... Yes I was a picky eater. And yes my parents are absolutely awesome!). While the stuffing that I love comes from a box, I did try to make my own last year - the first year I prepared my own part of the meal for M and I! I was so excited to show up with my kosher turkey and trimmings, especially my made from scratch stuffing. What a disaster! It was awful and all I could do was long for the mix my Mom had, infused with the gravy and shredded pieces from her turkey! I tried to replicate this the next year but it failed again. Something about stuffing just didn't seem to be working out for me... Until this year! 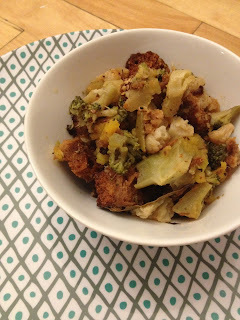 This year I decided to look at stuffing for what it really is. Bread crumbs mixed with all sorts of herbs and essentially pieces of the rest of the meal. So I got into the kitchen and started putting together the herbs I knew were quintessential to stuffing as well as a few veggies that scream autumn (and a few others, y'know just because!). Feel free to add shredded turkey, cranberry sauce or for an extra special touch, roast the veggies separately (i.e. butternut squash drizzled with maple syrup etc.) before adding them to the main dish. 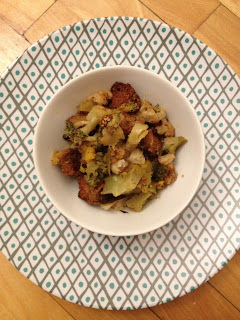 I hope you enjoy this recipe and that you have a chance to go through and incorporate the other Kosher Connection contributions to your Thanksgiving as well! Here's hoping that you and your friends and families have a wonderful Thanksgiving, that the sense of festivity and importance of family and appreciation continues long after the trimmings are put into their tupperware and that we're able to recognize and appreciate the incredible blessings we're given every single day! * you need not necessarily purchase frozen vegetables, you can purchase fresh however if you'd like to prepare the stuffing for a kosher meal, ensure that you check the broccoli and cauliflower thoroughly. Cut the Challah into 1" x 1" cubes. Prepare a baking sheet with parchment paper and lay out the cubed Challah in a single layer. Drizzle with olive oil and sprinkle garlic powder overtop. After 25 minutes, remove both from the oven and add the bread crumbs to the vegetable mixture. Combine and return to the oven for another 20 minutes. thanksgiving for me in canada meant a fun day off, here in the US it feels like a fun day off where I'm the ONLY one who isnt eating Turkey. I dont know about you, but in Canada NONE of my friends did TG! I love the idea of all those good veggies being part of the stuffing. Our school is opening on Thanksgiving so I am working. After all, we had two weeks off for Sandy. Do they serve the same types of foods on Canadian Thanksgiving? I never found it to be as big of a deal over there. Either way you are right to enjoy it now too. Looks great. And I love the other variations you posted as well! Happy Thanksgiving !! 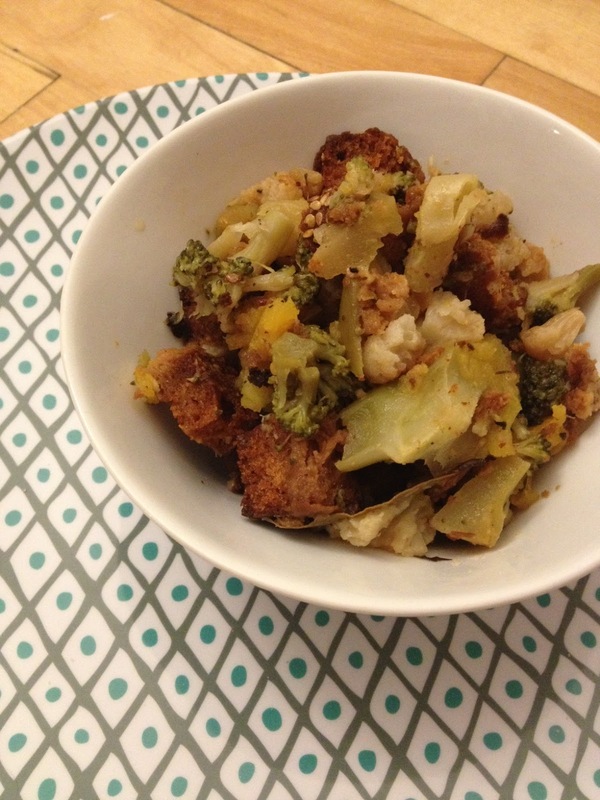 I have never heard of veggies in stuffing until today, and both you and Tamar included a wonderful mix of veggies. Thank you for the enlightenment. I love the addition of all the vegetables. I usually make stuffing with just bread and seasonings but this sounds just as delicious and a whole lot healthier. I grew up in a Modern Orthodox community in the States, where people generally celebrated Thanksgiving, but my husband grew up in Toronto and also says no one really made a big deal of it there. I love that you included lots of veggies, this looks yummy.